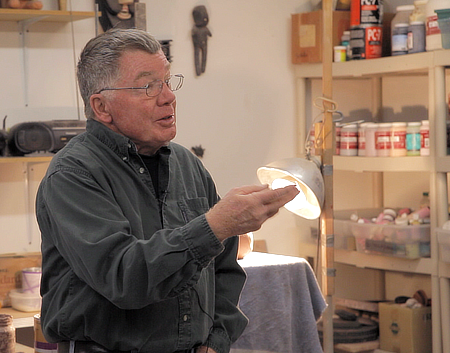 Our discussions with Bill Stewart and Phyllis Kloda at the Stewart studio arose from the initial work done for an instructional series provisionally entitled The Art of Pottery. Although we did shoot some footage of them working and talking, it remained wholly in the realm of the introductory. No syllabus or curriculum for an actual series was developed. At the time of writing this web page, we are still ascertaining the scope and depth of the video story that can be put together with the content we recorded in early 2012. We’ll update and expand this page as matters progress.